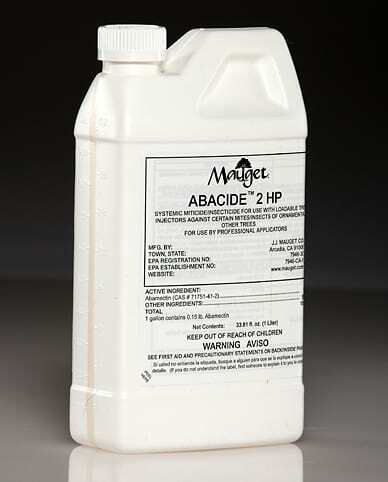 Mauget’s Liquid Loadable ABACIDE 2 Hp available in high volume one liter bottles as a Ready-to-Use insecticide for application with reloadable tree injection equipment (such as the ChemJet, QuikJet or Tree IV). ABACIDE 2 is a product containing 2% abamectin, a xylem/ phloem mobile insecticide for use on forest, woodland, Christmas, seed cone nurseries/orchards, and ornamental trees. It can also be used in residential or public areas such as parks, golf courses, cemeteries, schools, street tree plantings and interior landscaping. ABACIDE 2 insecticide provides superior management options for difficult to control phloem-feeding insects with a single application. Late summer or fall applications provide excellent control of conifer bark beetles the following spring with options of single or 2 year management with higher dosages. It can be applied in commercial or residential landscapes, interior and exterior plantscapes and other areas where ornamental trees and woody shrubs are grown. PACKAGING:1 Liter bottles or 4×1 Liter Master case. Click on an Insect for more information.